Customs are not only beautiful bikes to look at—they also allow whoever commissions them to get a truly personalized and unique ride. When a kid from Down Under decides to have some fun and enter a bike customization concept, the result is bound to have “fun” written all over it. The custom is the work of 22-year-old Australian mechanic Keeley Pritchard. 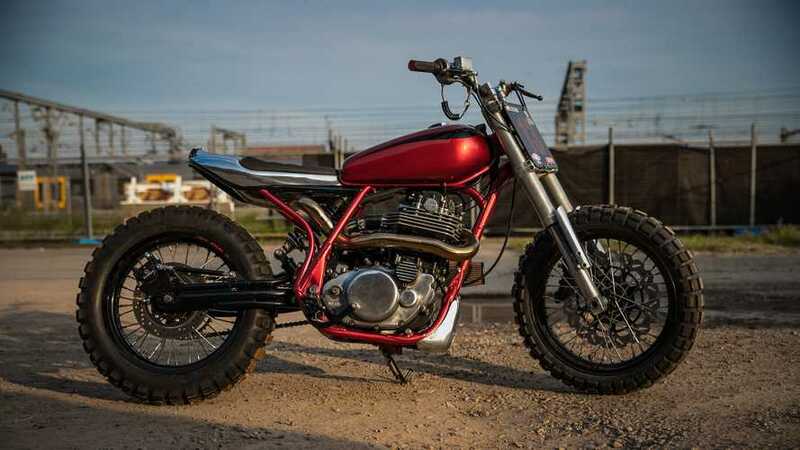 He entered his SR400-based creation in the Machine Show Bike Build contest, which meant he had exactly 10 months from the moment he decided to participate to the unveil. He used a 1986 Yamaha SR400 as his base, a little 399cc air-cooled single-cylinder lightweight that has remained virtually unchanged since its inception in 1978. Of course, during its 40-year run on the market, the little 400 remained fairly prehistoric and up until the last model-year 2018, even still used a kickstarter. Pritchard got creative with his custom. Among other things, he used the fork and brakes from a Ducati Monster (no mention of which model) as well as the shock after converting the SR from a dual shock to a single shock layout. He swapped the original spoke wheels for a set of 17-inch RMZ Motard fitted with knobbies. The former upswept exhaust has been entirely replaced with a striking, wrap-around pipe that belts the engine and exits behind the seat, built by 666 Fabrication. The best hidden secret on the bike, however, is just how much the tiny 399cc block is able to produce. Pritchard had big ambitions for his tiny bike—he opted to fit the block with an Aisin AMR300 Supercharger unit. Yep, that little thing is supercharged. Not a small feat to accomplish. He added a customized air filter adapted to the tiny monster’s needs. On a scale of “Absolutely” to “Hell Yeah”, how bad would you like to whip the SR400 Oily Rags custom? “No thanks” isn’t an available option on our scale. Our site, our rules. As for Pritchard and his, let's call it peppy SR400, it's not too surprising to learn that he won the Bike Build contest out of 36 entries.